TEMECULA, CA—August 25, 2009—ProSites Inc., the nation's most innovative dental website design has announced they are now offering free patient education videos to their members. The wide range of videos, showcasing numerous dental procedures and oral care techniques, are intended to help doctors educate current and prospective patients, increase case acceptance, and grow their practice. The HD quality video collection, produced by MediaMed Inc., features more than 40 dental videos in 10 categories including: exams and dental hygiene, cosmetic dentistry, periodontics, dental implants, oral surgery and more. The movies include high-quality video footage and computer animation that present dental topics in an easy to understand manner to educate a doctor's website visitors. "We chose MediaMed because their videos are of very high-quality and their animations are outstanding," said, Lance McCollough, President and CEO of ProSites. Continually enhancing the value ProSites provides to its members, the MediaMed patient educational videos are provided FREE of charge to all current and new ProSites members. ProSites has the unique philosophy of providing continual enhancements and upgrades free of charge, which ProSites refers to this as their FutureNow Assurance™ program. The ProSites advanced Web Engine Technology platform allows any upgrades to be automatically applied to every ProSites website with a simple mouse click from within the ProSites content management system. "Because technology is always evolving, our roadmap of future enhancements ensures our doctor's websites will never become outdated and that ProSites remains the most innovative dental website provider," said McCollough. Equally impressive is the ProSites Media Player used to display the videos, which includes a language selector that allows visitors to select between English, Spanish and French narrated videos. The integrated media player also features dynamic contact forms allowing visitors to contact the practice directly from the player, as well as a "Tell a Friend" form which automates a personalized email that can be sent to friends and family members with a hyperlink back to the exact video they were viewing on the dentist's website. Each video also ends with a "Contact Us" form to encourage communication between the visitor and the practice. "When designing our new media player we wanted it to do more than simply play videos," said McCollough. "We wanted to integrate some of the viral marketing technologies that have been proven so effective on the Internet. The 'Tell a Friend' form is a great way to enlist patients and visitors to help promote the doctor's practice." "ProSites really considered the needs of doctors and patients when designing their media player," said Dr. Nima Pakravan, CEO of MediaMed. "The combination of patient education videos with the interactive and viral marketing aspects of the ProSites Media Player will certainly increase practice growth and promote new patient referrals." 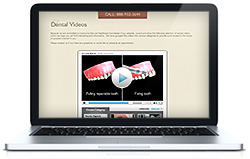 An optional software program of all the dental videos is also available for chairside presentations on a tablet PC, laptop or office computer. The software package includes a complimentary self-running DVD that can play in the waiting area of the doctor's office to stimulate patient interest in additional services. Doctor's can purchase the optional software package at a special discounted price available exclusively to ProSites members. MediaMed , Inc. is the premier provider for HD quality dental videos. Created by and for dentists, MediaMed patient education videos are a tool to help doctors promote services, increase treatment acceptance, and overall improve the dental office experience. MediaMed has corporate offices in both California and Toronto, Canada.